In a new article for the Guardian, political theorist Peter Hallward traces the genesis and continuing success of the anti-austerity student demonstrations in Quebec, urging organizers worldwide to take up the same model. Hallward attributes the rapid growth of the demonstrations to the students' ability not only to articulate an immediate aim--stopping tuition hikes--but also to situate that aim within a larger pushback against heightening neoliberal attacks on public programs. CLASSE, the radical student coalition spearheading the protests, has ballooned in numbers to a membership of over 100,000, and now claims to represent 70% of striking students. CLASSE has called for the unconditional abolition of tuition fees, to be phased out over several years and compensated by a bank tax, at a time of record bank profits. The hardline roots of the student protests have ensured the creation of a "practical, militant community of interest" that has organized the single biggest act of civil disobedience that Canada has ever seen. 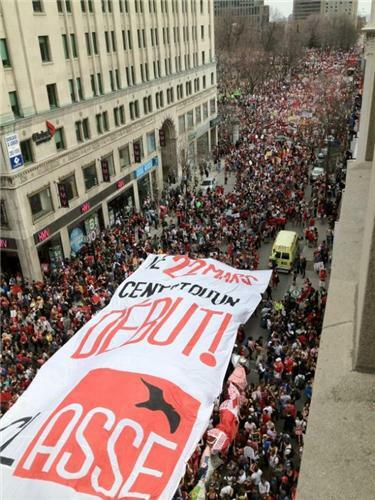 The result of months of careful preparation and hundreds of general assemblies, these massive student strikes have become too strong to contain, showing signs of radiating out to other parts of Canada--and, Hallward hopes, the rest of the world. "After a couple memorable springs," he concludes, "it's time to prepare for a momentous autumn."